Regional marketing is all about location, location, location! In general, regional marketing is a targeted allocation of resources to a certain geographic area, market, or district, ultimately with the main goal of receiving a return-on-investment. There are a variety of regional marketing tactics ranging from digital paid advertising to more traditional media placements on billboards, radio, direct mail, etc. Before you decide on tactics for your regional marketing campaign, you should first layout your campaign goals. - What do I want to achieve with this campaign? - What’s my competitive advantage? o What does my brand have to offer over competitors? o Is this advantage more important to consumers in this area? o What else can I offer? - Why do people in this certain region care about my product? o How can I leverage this? - How does my regional strategy complement my national strategy? o How can I scale my strategy if needed in the future? If you have a pretty strong idea how you would answer the questions above, then you are on your way to putting together a strong plan of action. So, how can aerial advertising help sky rocket your campaign? Aerial advertising, in essence, has many capabilities that appeal to regional marketers. Here are a few reasons regional marketing clients choose our airplane advertising banners and other services time and again. 1. Quick & Effective – Banner plane advertising, sky writing, and blimp advertising, to name a few, are all extremely effective regional marketing vehicles. Let’s say you’re a small-to-medium sized local brand looking to raise awareness about an event happening next month. An aerial banner can be flown every weekend over your area to get the word out. No more haggling for outdoor advertising space, or waiting for your 1,500 direct mailers to come back from this printer. You can get impressions quickly, easily, and effectively. 2. Versatile & Portable - But what if you need to change the messaging on your banner after your event has taken place? Not a problem. 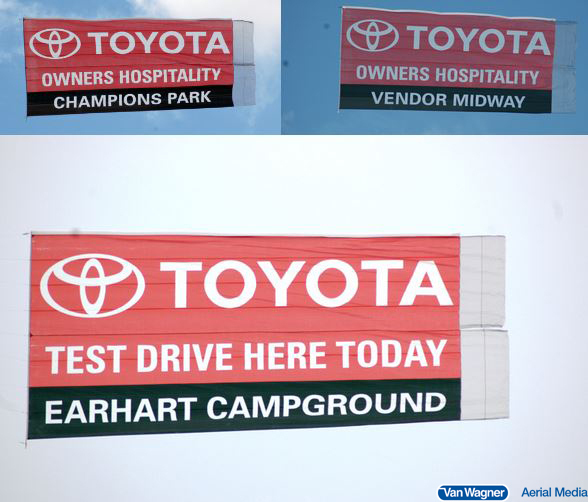 Van Wagner Aerial Media produces specially-made banners that allow you to change promotional call-to-actions when needed. Check out what Toyota did below. As you might suspect, aerial banners are extremely portable. Let’s say you are a regional marketer for a medium-to-large sized brand, and your main DMAs are the southeast and northeast. You can fly Florida’s coastline one weekend, then ship the banner up to the northeast and fly New York and New Jersey beaches the next. Think of your banner as your own portable aerial billboard, readily available whenever you need it! 3. 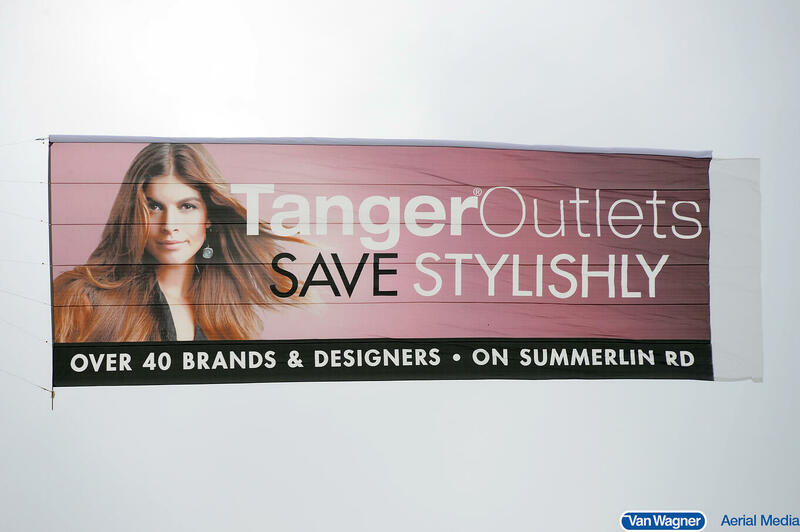 Save Money – Once your aerial banner is produced, you can fly it over and over again. In fact, Van Wagner Aerial Media guarantees that your banner will withstand weather conditions for up to 40 flights. Our aerial banners are extremely well-made and can often withstand years of service.The investment dollars you put towards an aerial banner are sure to come back to you in the long-run and cost a fraction of the price of traditional media. Your brand will be able to fly some of the biggest events of the year and you wont have to consider a costly event sponsorship. If you’re looking to raise brand awareness, get people to sign up for a service or purchase a product, or generally looking to get people talking on the ground and on social media, than aerial advertising is right for your regional marketing campaign. We offer free aerial assessments to all of our prospective clients, contact us today, or click below for your free quote!